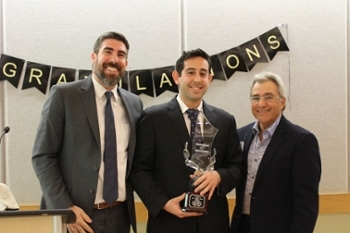 Mark Goldfeder accepts the We Stand with Israel Award from Rabbi Russ Shulkes, executive director of Hillels of Georgia, and Michael Coles, president. Mark Goldfeder received the We Stand with Israel Opher Aviran Award from Hillels of Georgia. The award is named for the former Consul General of Israel to the Southeastern United States, who served from 2010 to 2015.